Ama Hearts, from my heart to yours. I love to make pottery, I dabble in slab form pottery because it’s easy to do. I have been playing with it for several years now, and putting the finished products in my gift shop here at the bed & breakfast. I had a new idea that I thought I would try out. Here’s the story behind these hearts. I love to be in the rivers of Texas. My very favorite is the Llano River, anywhere from Junction to Llano and beyond. There is something that is very healing about being in a river. The water rushing over you seems to wash away any stress or pain you have. I know that standing in the granite sand is very healing because of the ions in the water and sand. I get away to the river as often as I can, sometimes to fly fish other times to just go and sit in the water. The last time I went, a few months back, it was one of the most calming and healing times for me ever. Some Native Americans call water, “Ama”. I watched a great documentary on it one time, and have loved that name for water ever since. 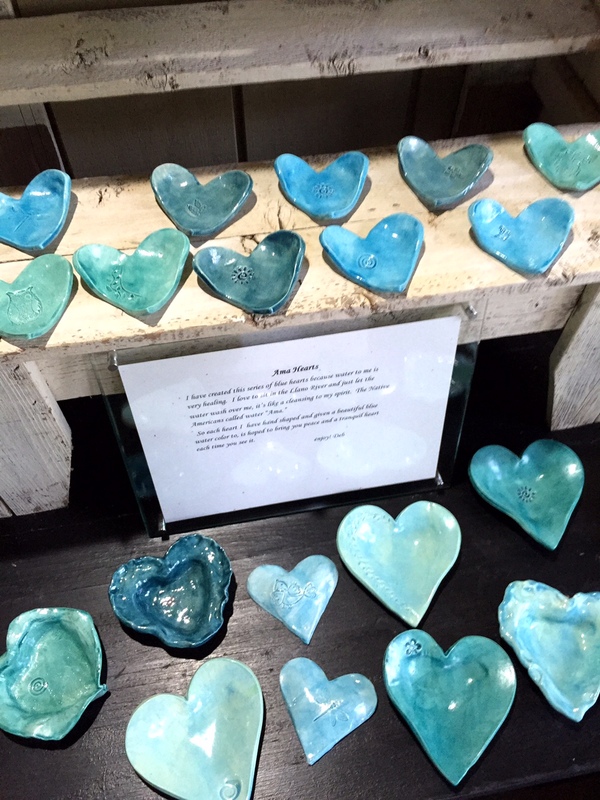 So I just finished a set of pottery hearts that I glazed all in shades of blue like water. I call them “Ama” Hearts, or water hearts. As I made each one, I hoped that those who purchased them would feel a peace like I did making them, since they reminded me of the river. I have the story about them written up by the display, so people will know why I did the hearts all in blue. This entry was posted in Deb's Doodles and tagged glazed stone, hearts, pottery by admin. Bookmark the permalink.